Naturally, a constraint solver nicely and easily solves this and more complex constraint satisfaction problems as shown in Philippe Laborie’s solution. When today I saw a pure SQL solution provided by Damir Sudarevic, I thought that it’s time to model this problem as a business decision model. It would not be as compact as provided solutions, but it should be oriented to business users. The decision variable “Number of Kids” is comes as a known input (300). 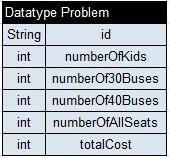 The decision variables “Number of Buses With 30 Seats” and “Number of Buses With 30 Seats” are our main unknowns, and I decided that their possible domain are between 0 and 30 (to cover at least 900 kids). 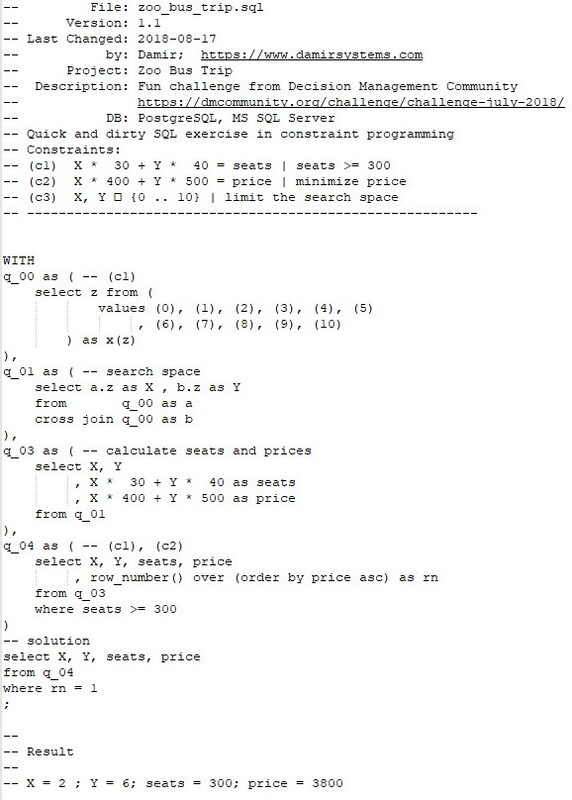 There are two more unknown decision variables “Number of All Seats” and “Total Cost” that depend on previous two variables. We need to minimize “Total Cost” while making sure that “Number of All Seats >= Number of Kids”. Of course, this decision model does not look elegant if you compare it to models implemented using specialized modeling languages – see for example OPL and DoCplex. However, it uses the basic decision modeling constructs familiar to our business users.